She's Fantastic: Jewel Lords SOLITAIRE! This action figure is great. 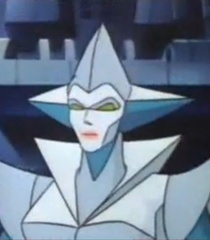 She looks feminine and robotic and gem-like and everyway she's supposed to look like. The bulkiness of the figure can make her look a bit masculine at times, but overall there's no doubt of her gender - which is a huge problem with older (and newer) fembots. She shows a lot of screws and joints from her rear view and from the side she looks paper-thin (probably to aid in her transfromation into a diamond), but from the front I think she looks great. The head and neck are a little on the small side compared to her strong-looking body, but I got over that pretty fast. She's a really fun toy. She originally came with a small gold sword which I unfortunately don't have. Her articulation is plentiful, but limited... if that makes sense. All her articulation serves a double-purpose of enabling her transformation (which is essentially a squatting pose for her, albeit with her head spun around). However, her articulation is all very 2-dimensional.. as if she's standing between two panes of glass with almost no forward or backward motion is possible. Still, she's pretty fun to pose regardless of these limitations. Here is her diamond form. you can see how she's really just sitting in a squatting/lotus postion. Again, you can really see a lot of screwheads from the bottom view. Time for a comparison shot! 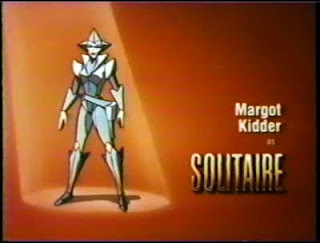 Here is Solitaire with the Transformers: Animated Arcee figure. In researching this figure, I found some an excellent site showing in-package shots (tiny), prototypes, and foreign variations. Check them out! I admit I loved the Rocklords when they came out, as absurd as the concept is. Great looking figure here, and the fact that she was voiced by Lois Lane herself? Priceless! I loved them, too. I also liked how there was a whole genre of "rock" toys in the 80's. 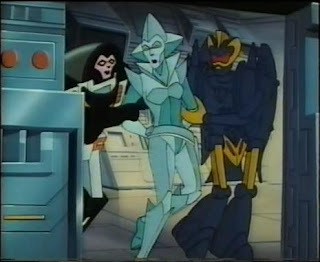 The Rock People from She-Ra, Metorbs from He-Man, the Granites and Maknokor from Inhumanoids, even Crystar (although they don't transform). I think rock warriors were the zombies of the 80's. I really hope we see a Granita in the MOTUC line!